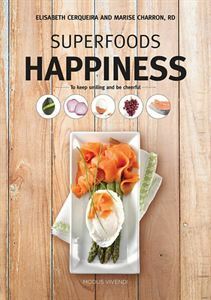 This book features 20 superfoods to lift your mood and over 50 recipes using these fabulous foods: Banana and Green Tea Smoothie, Asparagus Soup, Sardines and Spinach Niçoise Salad, Beet Chips, Salom Loaf with Vegetables and Herbs, Portoguese Clam, Walnut Lentil Patti and more. Author Marise Charron, Dt.P. et Elizabeth Cerqueira, Dt.P.